To symbolize that all phenomena are of a single taste in their true nature, he has one face. To signify the coming together of skilful means and wisdom, he has two hands. To symbolize the inseparable unity of bliss and emptiness, his complexion is white tinged with red. To symbolize his perfection of the vehicles of the shravakas, bodhisattvas and the secret mantrayana, he wears a monastic robe, a brocade cloak and a gown. As a sign that he has reached the level of a spontaneously accomplished vidyadhara, the very embodiment of the five buddha kayas according to the mantrayana and the culmination of abandonment and realization, he holds in his right hand a five-pronged golden vajra. Threateningly, he points it towards the demonic forces of dualistic clinging and conceptual thinking, and performs the enlightened activity of annihilating what is harmful. As a sign that he matures and liberates beings exclusively through the resultant vehicle and guides his followers with the great accomplishment of a vidyadhara with power over life, he holds in his left hand a kapala (skull-cup) containing a long-life vase. Since he is the embodiment of the three kayas endowed with the seven attributes, beyond the two extremes of samsara and nirvana, he cradles in his arm the khaṭvāṅga (trident) symbolizing beautiful Princess Mandarava. 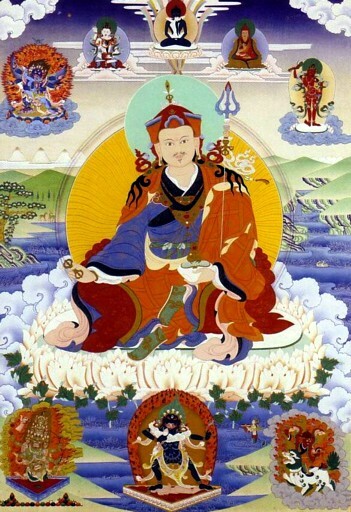 As a sign that he is empowered with the five buddha families, he wears the lotus hat. To signify that he has carried out the actions for his own welfare and is always ready to engage in benefitting others, he is seated in the graceful posture of royal poise. ↑ From The Casket of Siddhis: A Recitation Manual for Rigdzin Düpa by Rigdzin Jikmé Lingpa. Tulku Thondup, The Healing Power of the Mind (Boston: Shambhala, 1998), 'Invoking the Majestic Image of Padmasambhava' in chapter 13. This page was last edited on 8 October 2012, at 09:39.